“Hey. Let’s all promise that in 10 years from today, we’ll meet again, and we’ll see what kind of people we blossomed into,” said Ben, Bradley Cooper’s character back in the 2001 cult comedy movie “Wet Hot American Summer,” and the gang is indeed back! This line was obviously an omen of what the makers (Michael Showalter, and David Wain) had in mind 16 years ago, and now the long awaited Wet Hot American Summer sequel is finally almost here. A few days ago, Netflix gave us a sneak peek at the gang 10 years later by releasing a new trailer for “Wet Hot American Summer: Ten Years Later.” The sequel will be in form of an eight-part limited series that will be taking place, you guessed it, in 1991. As you can see, this lengthy trailer looks rather promising. 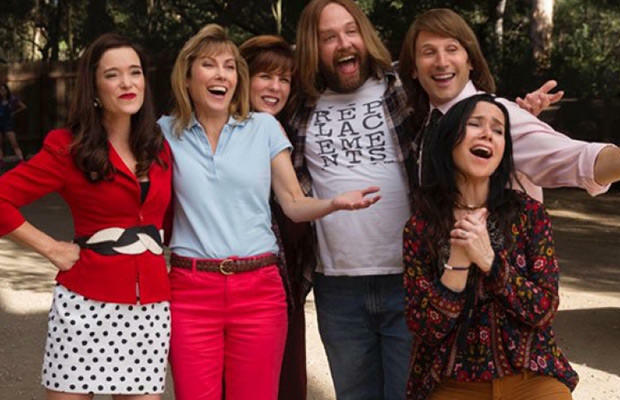 The writing is just as hilarious as we thought it would be, the gang looks as crazy as ever, and we simply can’t wait for “Wet Hot American Summer: Ten Years Later” to hit Netflix. One bad piece of news though – Bradley Cooper won’t be back to reprise his role of Ben due to scheduling conflicts. Luckily, the bulk of the original cast is back: Marguerite Moreau, Paul Rudd, Amy Poehler, Zak Orth… while there will be some new yet familiar faces as well, like Alyssa Milano! Also read: Top 5 Classic Comedy Movies To Watch When Bored!